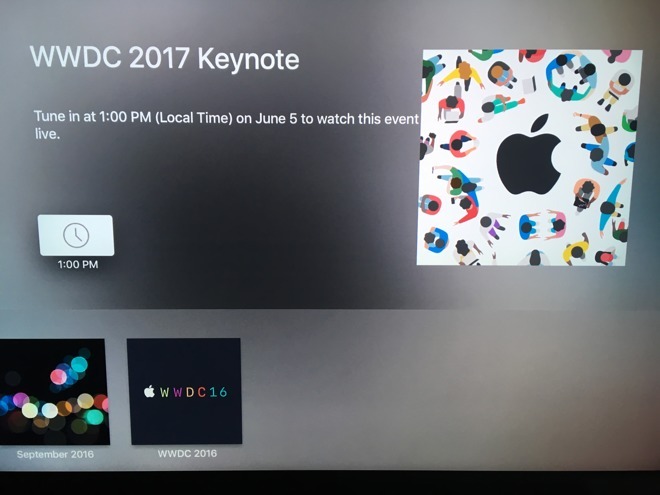 Apple on Thursday issued an update to the official Apple Events app for tvOS, including a new icon based on the WWDC 2017 logo, and a teaser letting users know they will be able to stream the June 5 keynote —expected to feature the unveiling of iOS 11 —live from their Apple TV. 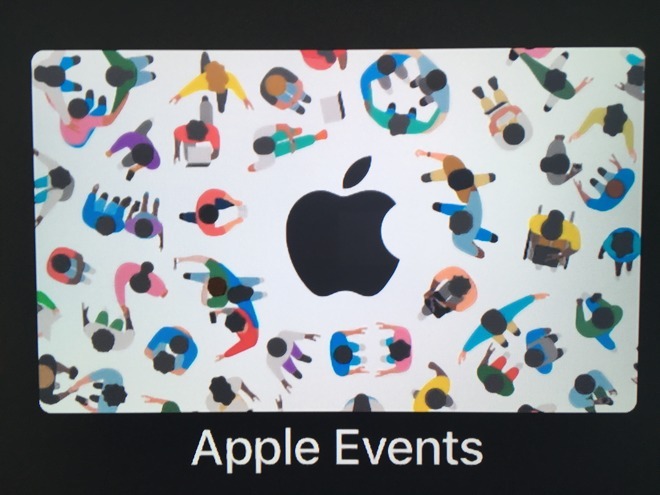 The new Apple Events app is available to download on the tvOS App Store. The app icon features the same art created by Geoff McFettridge, showing a crowd of people gathered around the Apple logo from the top down. Once opened, users will find a reminder to tune in on June 5 to watch the 2017 Worldwide Developers Conference Keynote. The presentation is scheduled to begin at 10 a.m. Pacific, 1 p.m. Eastern. AppleInsider will also be there live with full coverage of the event, which has been moved to San Jose for this year. It is expected to be headlined by the unveiling of iOS 11, the next-generation version of Apple's wildly popular mobile operating system platform for iPhone and iPad. As WWDC is a developer-focused conference, it's also expected that new versions of Apple's other major software platforms —macOS, tvOS and watchOS —will also be showcased and released in beta form. In a bit of a break from recent tradition, Apple is also rumored to update some hardware at this year's event, including its MacBook lineup. Specifically, updates for the MacBook Pro, 12-inch MacBook, and maybe even the outgoing MacBook Air could be on tap. It's also believed that Apple will unveil new iPad Pros this year, including a 10.5-inch form factor with a slightly larger display than the current 9.7-inch iPad Pro. Another potential unveiling could be Apple's rumored Siri home speaker, which is believed to be a competitor to the Amazon Echo platform. Reports have given the unannounced accessory a 50-50 chance of being seen and heard for the first time at WWDC 2017.